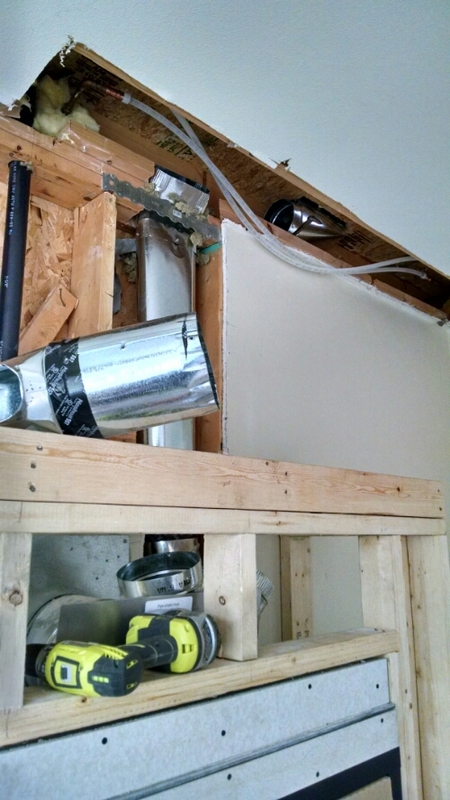 After discovering the box o’ ductwork, I spent some time scrambling around trying to figure out what to do. Jim and I met a couple times to try to figure out a solution, but no clear solution proved forthcoming until I met with Pat, the guy we hired to tile the fireplace. I explained the problem to Pat, who does kitchen and bathroom remodels singlehandedly, and he started thinking about what we ought to do. After some discussion, we agreed that Pat would take over the project from here, since he can finish everything that needs to be done on his own. This choice took a huge weight off my mind — the project may still take a while to finish, but we aren’t going to have the same scheduling gaps and down days just waiting, and I know who’s going to do what. Also, Pat is clearly a creative guy who enjoys problem-solving; his business is called Creative Home Works. A little ducting puzzle doesn’t faze him at all. 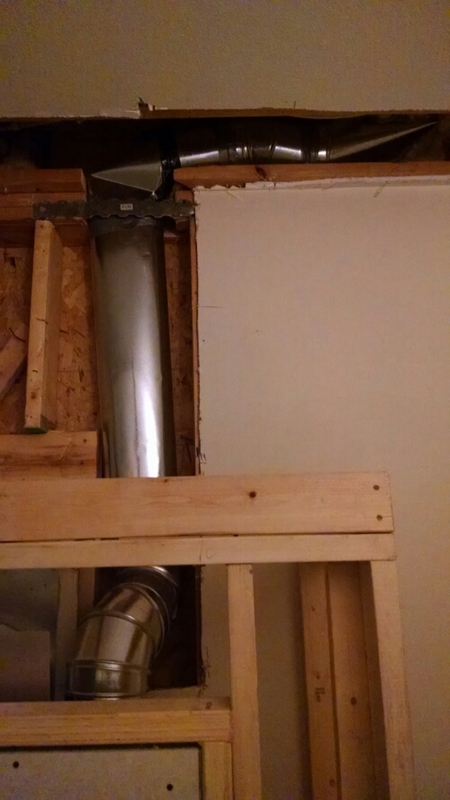 He started with yesterday and ended up taking the ductwork entirely apart and redoing it entirely. Unfortunately, I didn’t take a picture of this, but for a while we also had a hole in our bedroom floor that Benji spent a long time looking down. We could see down into the work area, and the novelty of seeing through the floor was quite high. Pat was very patient about having a peanut gallery watching and commenting, too. 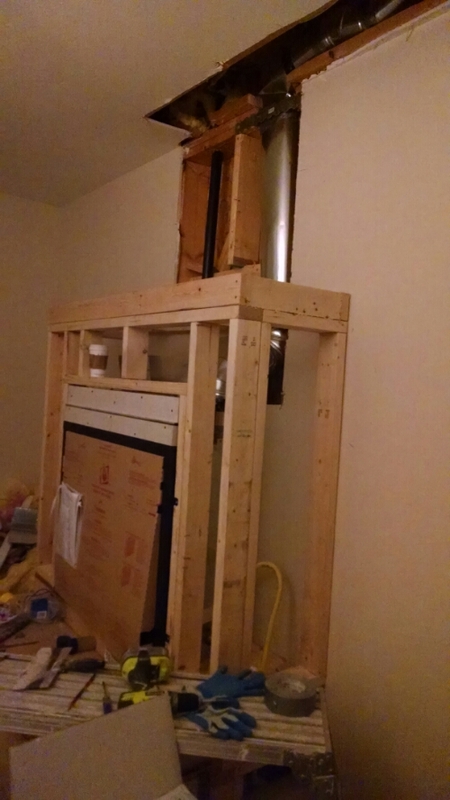 Anyway, by the end of the day, he’d testing all the ductwork and gotten the blower in our bedroom wall. The hole in the carpet is where the fascinating hole was; we don’t have any spare of this carpet, but will find a creative solution. 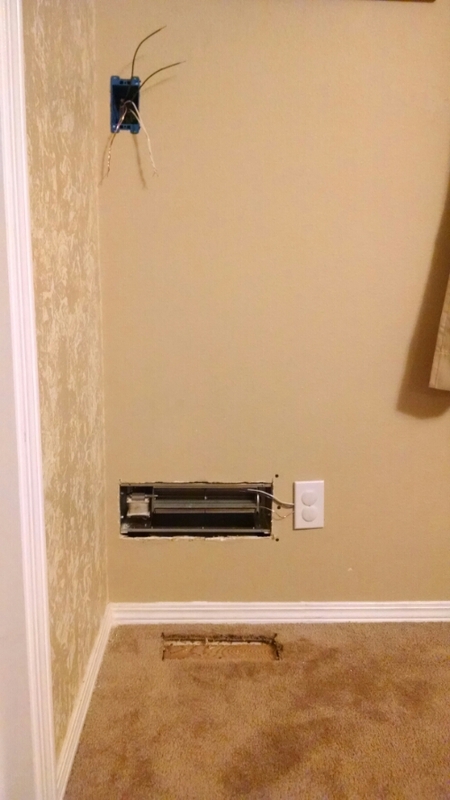 The unfinished electrical box is a control to turn on the blower. Ian just told me, “Wow. It feels like it’s really going to get done now.” That articulates pretty well my feelings, too. Before, I kept having to struggle and fight for every inch of progress; now I know it will progress no matter what. We may still have hurdles, but I feel more confident at overcoming them. I vote for reopening the spy hole in the floor, added a vent cover just to prevent broken ankles, and forgetting about the carpet. Eventually you can fill in the hole when you re-carpet. You could even build a reverse periscope!!! I second Mare’s motion. Also, I’m happy for you that you feel better about the project with the switch in workers. It will all come together eventually, seems painful at the time. Having been there myself…hope that cheers you on!